In the course of the Hamburg Metal Dayz – an event parallel to the current Reeperbahn Festival in Hamburg, Germany – Wacken Open Air has announced a string of new bands for the roster of the already sold out 30th-anniversary edition of the festival. Next year’s billing will feature more rock and metal classics such as Hammerfall, Queensryche, and Sweet. Friends of a more progressive approach are bound to celebrate the edition of Opeth, while adherents of darker sounds will look forward to Primordial and Hamferð as well as Eisbrecher – for those inclined towards the gothic scene. Fans of the deadly style are being served with Thy Art Is Murder and Critical Mess. Even old-school punk finds its place among the newly added as represented by The Adicts, while Life Of Agony and The Night Flight Orchestra are tossing in rocking undertones to underscore the wide range of stylistic variety offered at the next Wacken Open Air. The festival promoters have previously announced the following bands for the anniversary edition of the Wacken Open Air: Sabaton, Parkway Drive, Demons & Wizards, Powerwolf, Airbourne, Rose Tattoo, Within Temptation, Meshuggah, Krokus, Dark Funeral, and Avatar. 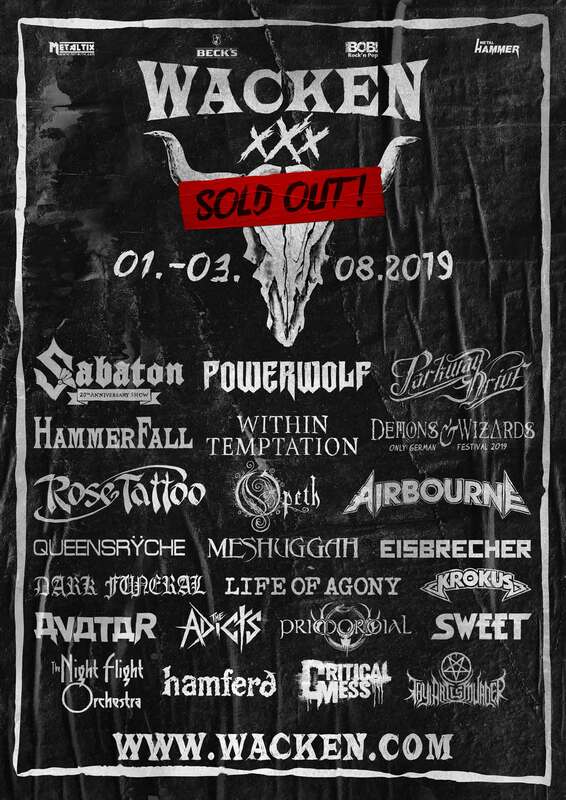 The 30th-anniversary edition of the Wacken Open Air, which takes place from the 1st to the 3rd of August 2019 is already sold out. Pre-sale of the 75,000 festival tickets in total started at midnight in the night from Sunday 5th to Monday, 6th of August and ended after only 4 days.